What was little more than a concept ten years ago is now becoming mainstream thanks to a growing number of people who believe that the reach of entrepreneurship extends far beyond business. People everywhere around the world are waking up to a dream not based on dollars, but social change. In this blog we will look at the importance of being unreasonable and why one organization sees it as an essential trait to becoming a social entrepreneur. Social entrepreneurship, in its essence, is about using raw entrepreneurial skills to solve a social problem. Rather than relying on the government, corporations, or a charity to address an issue, social entrepreneurs try and put the world on their shoulders to drive in a solution. We believe the dawn of the social entrepreneurship era was back in the 1970’s when Muhammed Yunus, the founding father of microfinance, created Grameen Bank. He conceived the idea while talking to a group of local craftsmen in Bangladesh. When he loaned this group the $27 dollars they needed to get their business venture off the ground, it struck him that an opportunity existed to bring a whole new level of finance to the underserved third world. What happened next is history, with Yunus turning Bangladesh into the birthplace of microfinance, which has now spawned into a billion dollar global industry. 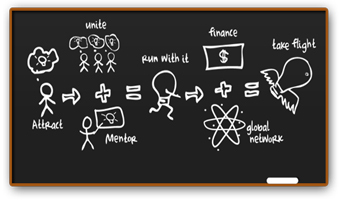 The process of becoming a social entrepreneur is very similar to that of becoming a business entrepreneur. You need to put together a business plan, a team and raise some capital. While some people may associate the term social with a fluffy way of doing things, this is not the reality of social entrepreneurship. So what does it take to become a social entrepreneur who can get the job done? According to the global social entrepreneurship incubator, the Unreasonable Institute, you need to be one thing: unreasonable. What does it mean to be unreasonable? You need to be crazy enough to think that your idea can solve a prominent global issue and change the world in the process. Sounds reasonable ok. So how does this organization, or anyone else for that matter, differentiate the people who sound crazy from the people who are crazy (about their ideas)? The Institute goes through a rigorous screening process where they watch video applications from hundreds of social entrepreneurs from around the world and whittle the group down to 35. Their ideas are voted on (with real money) by thousands of experts around the world in the Unreasonable Marketplace. Like any other business, the whole objective is to see if the idea and business plan are feasible. When you break it down, it’s just like starting up any other business. When the votes are in, 25 individuals are invited to join a team of over 60 experts in the summer for an ten-week bootcamp on building a scalable social venture. In what has probably become our favorite tagline, the Unreasonable Institute claims “we accelerate the world’s most unreasonable entrepreneurs.” Never has being unreasonable been so fashionable. Now if you are sitting there in your chair, reading this blog, thinking that you are a highly unreasonable person with a big, socially scalable idea, and it’s before November 30th, then apply for the 2011 cohort! The seeds of social entrepreneurship can be seen everywhere around the world, as people begin to scratch their itch and make things happen. Universities, MBA programs, corporations, and governments are feeling the force and providing various degrees of education and support for social entrepreneurs. In Brazil (watch for our blog next week on entrepreneurship in Brazil), the Hub, a social entrepreneurship startup hub, is teaming with Artemisia up to pioneer the inaugural social venture pitch competition this weekend (November 18). At Lumos, we were introduced to the concept of social entrepreneurship three years ago, in the halls of UVic Business, through our Global Sustainability course. Our case study for that class was on Honey Care, a social venture that was started in Africa, which was a very unique case study to be examining at that time in a business school. Earlier this year, we got some skin in the social entrepreneurship game when we did some business planning work for the Woodwyn project here in Victoria. Overall, we believe that there is no better time than now to boulden up and be unreasonable. Whether bouldening up means getting in an application for next summers bootcamp in Boulder, or logging in to Kiva to kick in $25 as a microfinance loan for an entrepreneur across the ocean, jump in, you won’t regret it. While business is business, this is personal, and that’s the beauty of it. This is long overdue, but we truly and deeply want to say thank you for this amazing post! It helped us a great deal with attracting applicants last year and we are incredibly grateful!